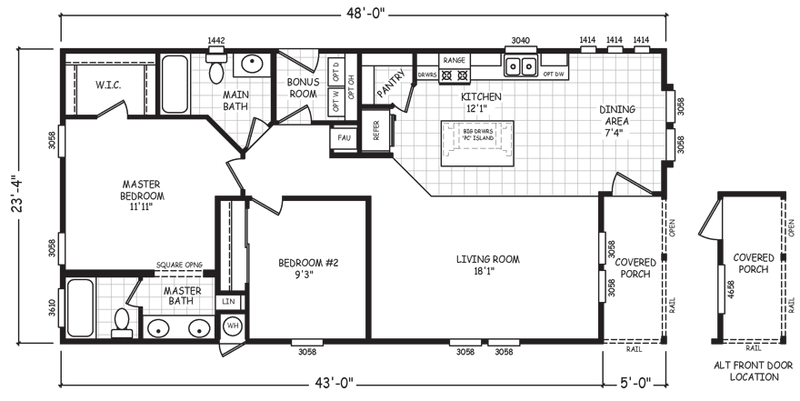 The Centennial model has 2 Beds and 2 Baths. This 1125 square foot Double Wide home is available for delivery in Arizona, California, Nevada, New Mexico, Colorado, Utah. When you hear the word Centennial, prestige comes to mind. This model certainly doesn’t disappoint. Highly coveted by families valuing modern conveniences and plenty of space to entertain, the Centennial mobile home has something for everyone. Homeowners can enjoy their morning coffee on the private covered porch that is bursting with curb appeal. Guests will immediately be drawn to the spaciousness of the living area and kitchen. The cozy bonus room makes this home the perfect setting for any event or gathering. If pictures are shown, they may depict upgrades and options that are not included within the base price of the home. Ask your housing consultant for details about the other great features that come standard on the Centennial manufactured home.